It’s just about here, folks. Stephen Merchant’s upcoming comedy series for HBO now has its first trailer, and it looks hilarious. 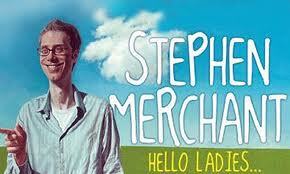 As we’ve previously reported, Merchant plays an awkward Englishman looking for love in Los Angeles. The show will debut on September 29 and this little trailer shows Merchant and Nate Torrence trying to talk to ladies in a club in the city. The results are satisfying. Merchant went on a stand up tour last year and explored this situation, and it was received very well. The show stars Merchant, Christine Woods, Nate Torrence, and Kevin Weisman. I hope Ricky Gervais makes an appearance at some point on this. Enjoy the trailer. This entry was posted on Monday, June 10th, 2013 at 12:55 pm	and is filed under News, Television. You can follow any responses to this entry through the RSS 2.0 feed. You can skip to the end and leave a response. Pinging is currently not allowed. « Blu-Ray Review: ‘Seven Psychopaths’!! !